At this event in Leeds Central Library we invited members of the public to come and see how we’ve been creating online stories to share the history of Leeds’ Chinese community. Visitors were able to explore a range of archive materials and Chinese language books held by Leeds Libraries, alongside objects from Leeds Museums and Galleries. We then asked them to share their own histories and experiences of what it's like to be Chinese and live in Leeds. 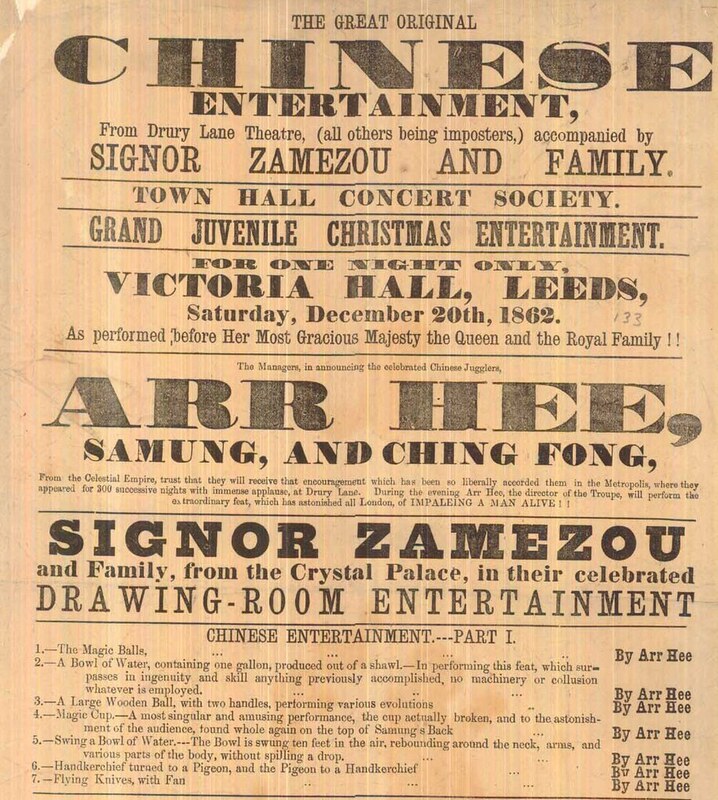 A playbill for 'The Great Original Chinese Entertainment' at Victoria Hall, Leeds, on Saturday 20th December 1862. Leeds Central Library holds a number of historical items which allude to Chinese residents and Chinese culture in the City, for instance in the historic playbills which can be viewed at http://www.leodis.net/playbills/. Images of 'Chinese Entertainment' from a historic Leeds playbill. 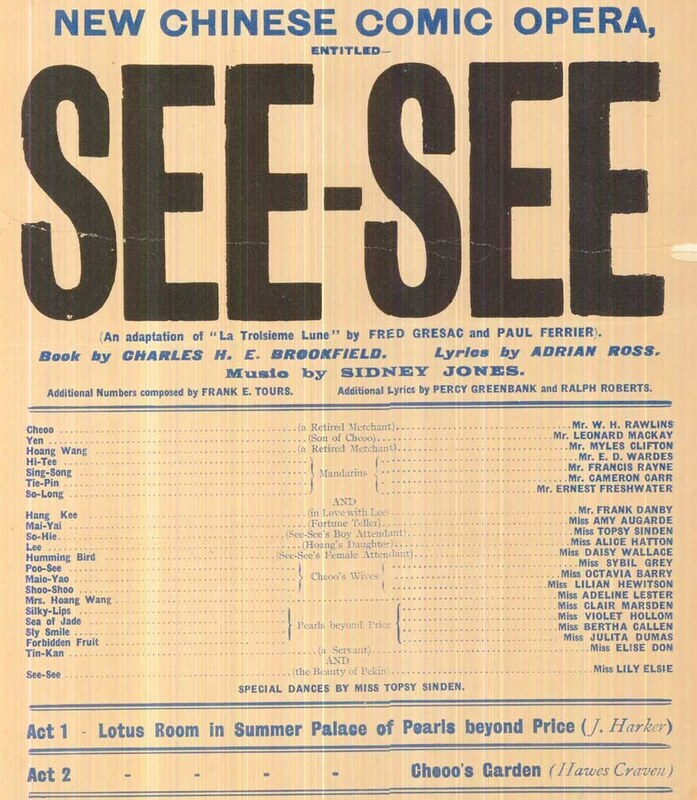 Many of the 'Chinese' performances alluded to on historic playbills were created by and for the non-Chinese population. In reality, the 'Chinese' magician Ching Lau Lauro is thought to have been from Cornwall. 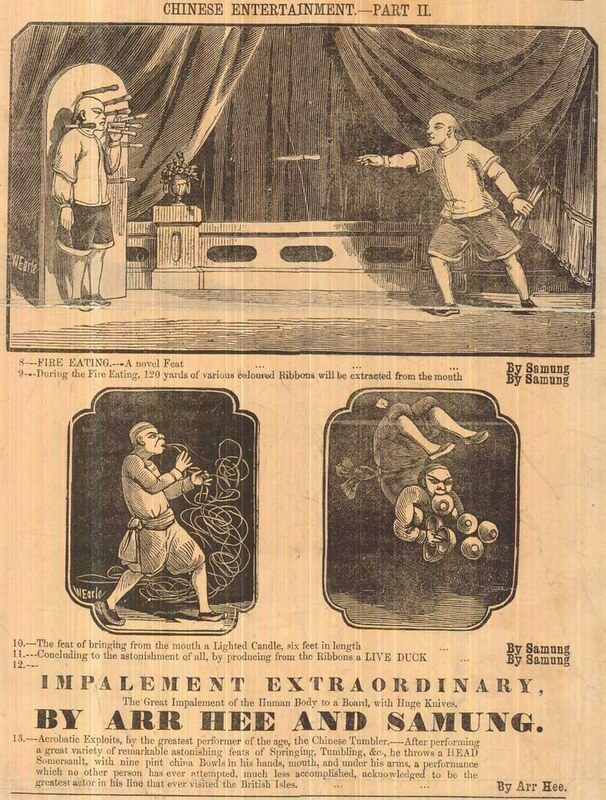 His show, performed in Leeds in 1834, mixed magic tricks and acrobatics, in the persona of a Chinese 'buffo' (the name usually given to the comic character in Italian opera). This short film by Michael Schofield documents work on the project 'Leeds is My Home'. In response to this, staff and pupils at Leeds Chinese Community School have been exploring Leeds’ historic archive before creating digital stories on the Yarn platform which integrate these artefacts with their own stories, memories, images and film. Participants were able to view the Yarn stories and 'Leeds is My Home' film at our workshop. One, who volunteers as a teacher at Leeds Chinese Community School, was glad to see that our film reflected the way in which Leeds' Chinese community has changed over the years, with Chinese residents working in a diverse range of professions as well as those traditionally associated with earlier waves of migrants to the UK. At one of our workshops, pupils created artwork and demonstrated their writing abilities in Mardarin and Cantonese to share information about Mid-Autumn Festival and their thoughts on living in Leeds. We learnt that, for the majority of pupils we spoke to, the festival is quite a low-key celebration. Everyone seemed to express a liking for mooncakes! Reflecting on the changing professional status of Leeds' Chinese residents and the increasing importance of Mandarin for international trade. The Kee Hong Chinese Restaurant is just visible in this photograph of Boar Lane in 1962. This picture was sourced from the Leodis archive at www.leodis.net. "The first Chinese Restaurant to open in Leeds was Man Fangs in Cross Belgrave Street. I believe it opened in 1958/9. I definitely remember going there for a 15th birthday treat with my Father, Arthur Moss who was a regular customer, in January 1960." "I visited them all in the late 60's as part of my job. I designed and set the type for the menus whilst working as a compositor at Norman Lewis printers. I was always treated to a meal whenever I visited, very good food, very genourous people." We can also find records of Chinese residents in the Census but, on the whole, the Chinese community is very underrepresented and authentic Chinese voices are missing from the records. As one of the activities at our workshop, we asked participants to add locations which are important for the Chinese community to a map of Leeds. Adding imporatant loactions to a map of Leeds. Artist Suna Xie with the Chinese handling box loaned to us by Temple Newsam House, Leeds. At our digital storytelling workshop, we were fortunate to be able to present a number of handling objects contained within this beautiful Chinese handling box owned by Temple Newsam House, Leeds. The box was created as part of the 2008 China in Yorkshire festival, during which museums and galleries across Yorkshire worked with their local Chinese communities to showcase their Chinese collections and highlight Chinese cultural activities throughout the county. We used the box and its contents as a starting point for thinking about cultural fusions in the lives of participants and in society more generally. Artist Suna Xie, who created the box itself, was inspired by the way in which hand-painted wallpaper at Temple Newsome House brought together Chinese, British and American influences. 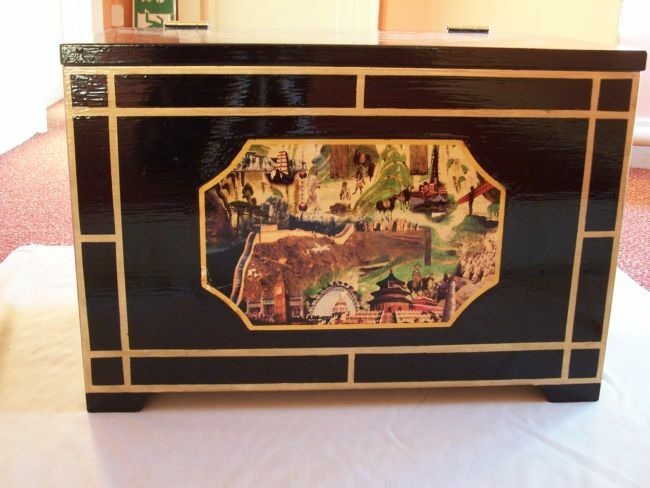 Accordingly, the box is decorated with a montage of imagery from both British and Chinese culture. The back of the box, with St Paul's Cathedral and the London Eye nestled below the Great Wall of China. The design on the box lid. One young visitor enjoyed spotting English landmarks such as St Paul's Cathedral and the Angel of the North, which occupy the same landscape as Chinese settings on the collaged box panels. We also spotted a lollipop lady, a footballer and a Buddha figure. A selection of items from the Temple Newsam House Chinese handling box, laid out at our workshop. Rosie (University of Leeds) and Ross (Local History Librarian) waiting for visitors to arrive. 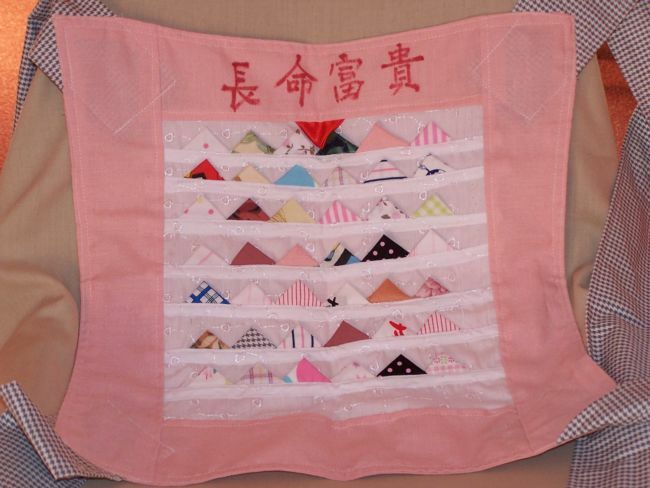 A traditional baby carrier made by a member of Leeds Chinese Women's Group. The triangles of different coloured cloths represent long life for the child. These are some of the items contained within the box. 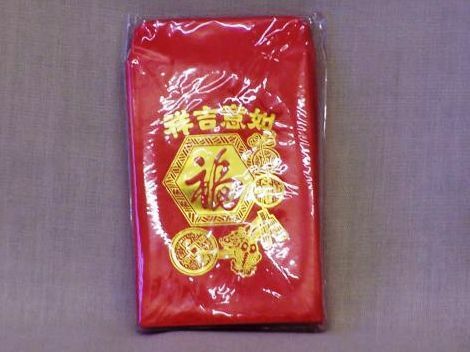 Some, such as the baby carrier and the rice packet were created by members of Leeds Chinese Women's Group. We're particularly interested in the role these types of objects play in lives of the City's Chinese residents today. For instance, one family arrived at the workshop with their smallest member in a modern, soft-structured baby carrier. We discussed the pros and cons of the traditional baby carrier on display (simple to make and more portable but perhaps less comfortable than modern padded designs) and changing British attitudes to 'baby-wearing' (i.e. carring in a sling or close carrier). Mei-tei style carriers, which derive from the design of traditional Chinese versions, are now popular with many UK families. More complex versions incorporate padding and buckles for comfort and support. 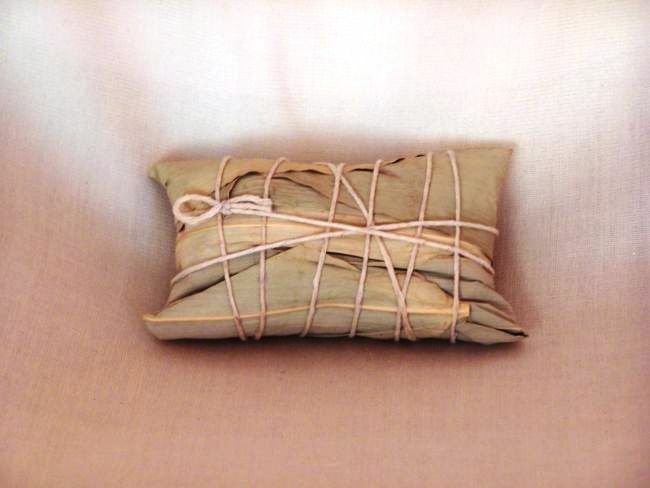 This is a mock-up of a rice packet, traditionally used as part of the Dragon Boat Festival. The rice is wrapped in banana leaves and tied with string. 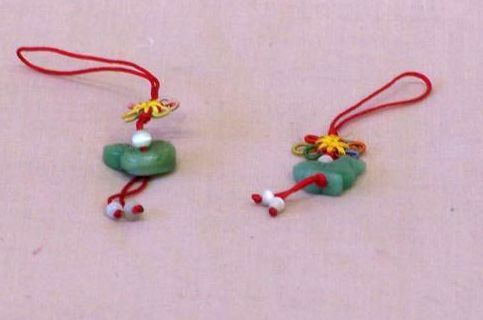 These jade-effect pendants, depicting figures of the Chinese Zodiac, can be hung from a mobile phone to bring good luck. 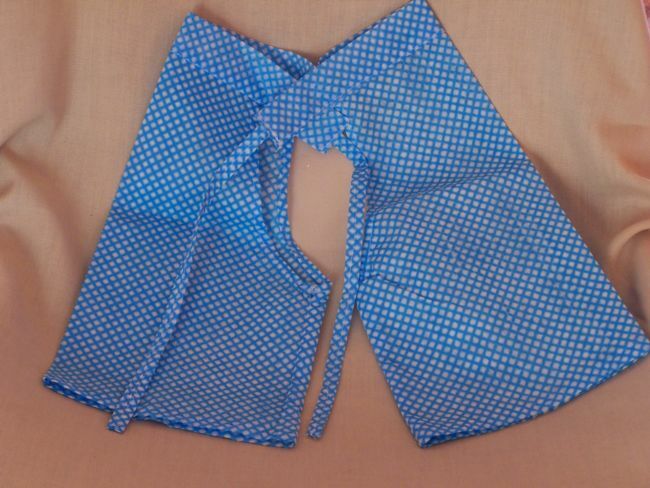 These split-crotch trousers, made from a J-cloth, demonstrate the style of trousers often worn by toddlers in China. The hole means that a nappy is not required. 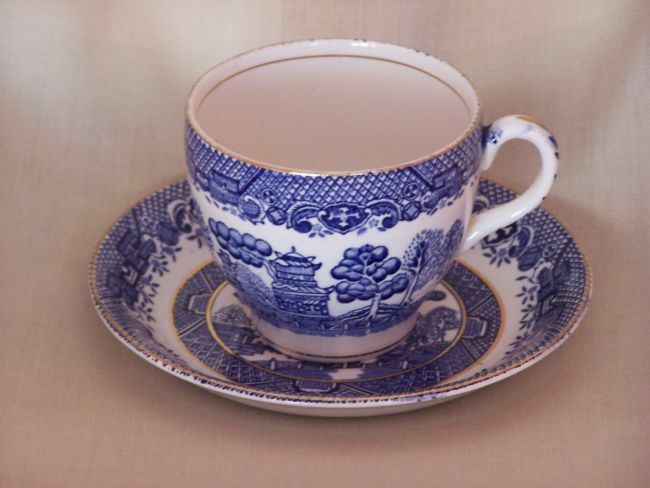 This willow pattern Staffordshire teacup and saucer is perhaps a familiar sight for UK residents. Pottery like this took its inspiration from Chinese art and folklore and was produced for a European market from the Eighteenth Century onwards. 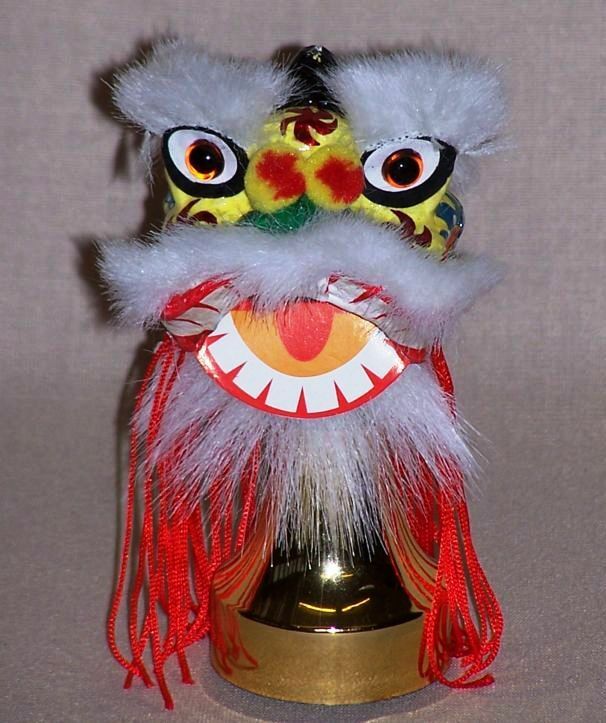 A model of a lion dance costume, like those worn by performers at Chinese New Year. 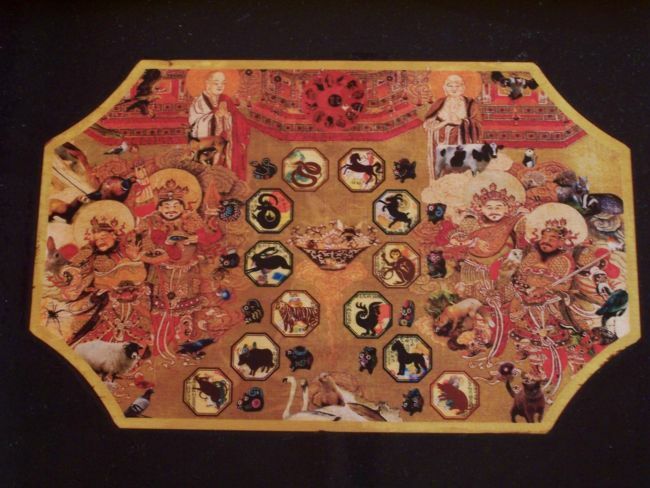 Many of the items in the Chinese handling box have associations with Chinese New Year, which takes place in February. Leeds Chinese Community Association organises the City's festivities in the Town Hall which includes dance, music, calligraphy, Kung Fu and more! Our younger visitors enjoyed colouring pictures of dragons, an important emblem in New Year festivities. 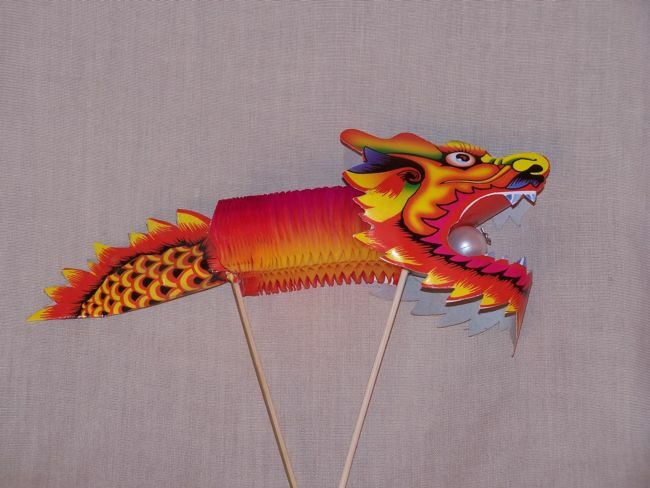 Dragon dance puppets like this are a popular toy at Chinese New Year. 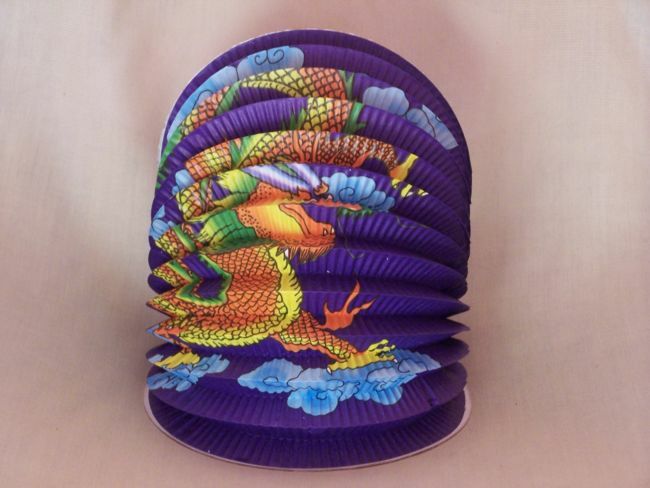 A purple lantern with dragon motif. One of the children who came to the workshop recognised these red paper envelopes and told us how his grandparents put money inside to give to him at Chinese New Year. "I talk to my family in Shanghai and Yangzhou every Sunday morning on Facetime. I like being able to talk to my Grandad, Grandma and my Dad. When I visited my Grandad, Grandma and my Dad in China it was hot and when it is raining it is heavy." (M, age 6). "My Father was the first generation of my family who has emigrated from Hong Kong to Leeds in 1963, aged 17. He worked in one of the earlier Chinese restaurants called 'Jumbo Chinese Restaurant' which is no longer present. I am the second generation still living in Leeds and my son is now the third generation. I studied at the Leeds Chinese Community School as a child; I have volunteered at the same school as a Teacher's Assistant in the past for 2.5 years; now I volunteer as a Committee Member at the school. My son has started attending the school last year when he turned 5 years old, learning Mandarin. I studied Cantonese as this was the only language option available in the past years." Video-calling apps like FaceTime and Skype can help families living in different countries to stay in touch. We asked participants to add their thoughts and stories to comment cards. Sometimes writing on paper feels easier and more immediate, though others prefer to type straight into a Yarn story. We digitised the paper stories by photographing them. The story of one family's move to Leeds from Hong Kong. We chatted about family histories and mobile phones came in handy for sharing old family photographs. A recent trip to China provided an opportunity to explore family history and make digital copies of old photographs. Local History Librarian Ross demonstrated how it is possible to search for Chinese residents of Leeds in historic census records available online. Census records online. This one records a Chinese student living in Leeds with a family of Chinese language teachers. Reflecting on how things have changed over the years. "before satellite TV and internet it was difficult to watch Chinese TV and film. My Dad used to rent video tapes so that he could watch films." "My Dad's takeaway was closed on Sundays and the community used to get together. It feels like everyone knew each other back then". We asked how easy or difficult it was to celebrate Chinese culture and heritage whilst living in the city. One visitor remarked that it was difficult, since she'd like to cook Chinese food from scratch everyday but can't always get hold of the right ingredients. She added, however, that it was good to be able to buy some Chinese ingredients in UK supermarkets. A selection of books held at Leeds Central Library. At Leeds Central Library it's possible to access an array of Chinese language books for both young and adult readers. However, if you'd like to learn more about Chinese literature in translation you may also be interested to learn about the 'Writing Chinese' book club and events held at the University of Leeds (https://writingchinese.leeds.ac.uk/).